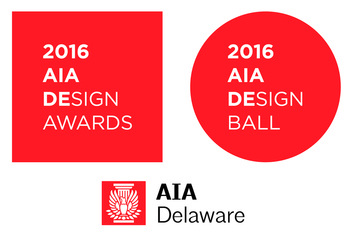 Awarded projects will be announced at the 2016 AIA DEsign Ball, a celebration of design and construction in Delaware. This event is the centerpiece of AIA Delaware’s 2016 Design Awards Program, and will be held on Tuesday, April 18, 2017 at a location to be announced in or near Wilmington, Delaware. Participation is open to all licensed members of AIA Delaware (to include those who have submitted an application for membership in 2016 and 2017). Entries are welcomed and encouraged from both established and new practitioners and designers and from small firms and large. Firm entries must be submitted by an authorized principal or partner. If the project being submitted was created in collaboration with another architect or architecture firm, the submitting firm must have provided the primary design leadership for the project. Unassigned AIA Delaware members are invited to submit projects located in Delaware for award consideration.